News of the future was, in my youth, something that one found by crossing the palm of a lady in a dark tent with a piece or two of silver (or the modern equivalent) at one of the fairs that came to town. Such opportunities still exist, with all the caveats that existed back then likely still being in force. However projecting the future, whether of the weather, the likely corn crop this year in the United States, or the production of crude oil by the nations of the world has become a much bigger business with copious tables, graphs and theories replacing the rather worn pack of cards or crystal ball of my youthful experience. Our part of the world underwent a drought last year severe enough to kill several trees in our yard, for example, as well as hurting the corn crop. This year, corn plantings have been severely impacted by the heavy rains and cold weather, so that decisions on crop plantings have become more complicated and delayed, with follow-on impacts on the ultimate yield in a number of Mid-Western states. Corn yield apparently falls at an average rate of 2.3 bushels per acre per day of delay in Northern Wisconsin. 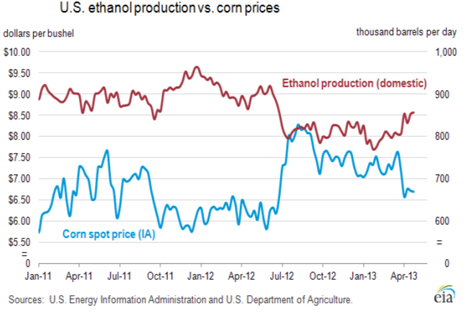 These changing conditions make it difficult to assess how much ethanol, for example, will be available to meet demand, although the latest EIA TWIP holds out some optimism for this year. 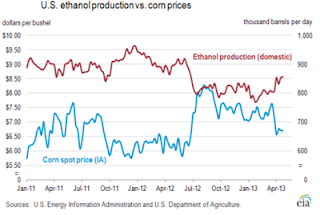 The impact of the drought on corn prices, and the consequent fall in ethanol production, as production costs rose, are directly visible from their plot of the two over the last year. However, with the weather impacts still being assessed it is already being concluded that the US corn crop is unlikely to reach the record level of close to 14.6 billion bushels that were earlier projected. It still, however, has the potential to reach around 12.3 billion bushels, which would satisfy the just under 5 billion bushel need for ethanol, as well as other demands of the market. By May 12th only 28% of this year's expected crop had been planted, in contrast with a normal year where 65% would be in the ground. Thus even the relatively short-term projections of the EIA could yet be in trouble for this year. Moving to the slightly longer-term the nations that form OPEC must try and estimate global demand for their products, and the amount that other non-OPEC nations will produce, so that they can balance supply and demand at such a level that will sustain prices at a level they are comfortable with. 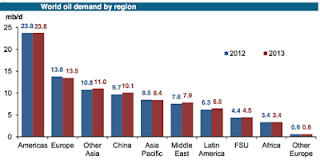 Their estimates come out as Monthly Oil Market Reports and in the latest (May) version they continue to expect global demand to increase by 0.8 mbd over 2013, but are beginning to hedge that bet, as the global economy continues to appear anemic, with Russian and Asian economies slowing. Yet by the fourth quarter of the year they anticipate that global demand will reach 90.9 mbd. 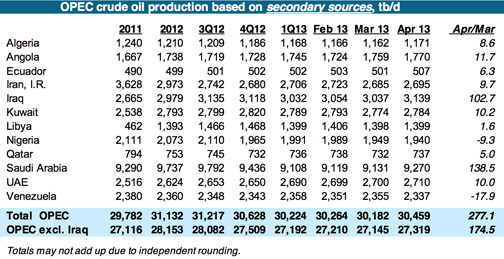 On a quarterly basis, US oil supply is seen to average 10.62 mb/d, 10.67 mb/d, 10.62 mb/d and 10.61 mb/d respectively. On a quarterly basis, Canada’s production is anticipated to average 4.02mb/d, 3.97 mb/d, 4.02 mb/d and 4.12 mb/d respectively. Russia is expected to continue to lead in oil production over the course of the year, although it is not longer expected to increase production above current levels. 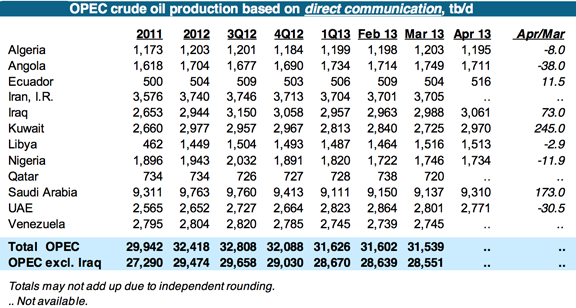 On a quarterly basis, Russian oil supply is seen to average 10.45 mb/d, 10.43 mb/d, 10.43 mb/d and 10.43 mb/d respectively. And this brings us back around to OPEC as they try and balance their production against the gap between global demand and non-OPEC supply. As has been the case for a while, OPEC produced two separate tables showing production, as reported by secondary sources, as well as those directly reported by the countries themselves. 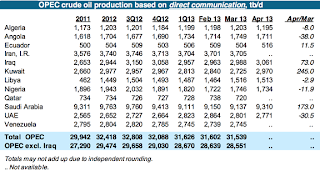 It would appear, with Manifa coming on line, that Saudi Arabia is increasing production again, while Venezuela and Iran would have you believe they are producing more than they are, and Iraq, which is now producing above 3 mbd, is directly reporting less (though that could be because some of that production is coming from the north, and there are some communication problems between there and Baghdad). As long as OPEC has available reserves it can continue this balance to keep enough oil available at an acceptable price to allow the world economy to continue at its present pace. And with that ongoing adjustment available, their projections for this year of a relatively stable price would seem fairly founded, absent some major change in one of the larger producing states. Iraq overtook Iran as the second largest producer in OPEC last year (according to secondary sources) and expects that with production from Majnoon, it will increase production capability by upwards of 200 kbd by the end of the year. Ultimately the goal is to achieve a target production of 1.8 mbd. However, as overall production levels increase, Iraq may join with the Kingdom in controlling production to maintain price. Yet even with those abilities OPEC is becoming cautious over predicting that their estimate of the demand:supply balance numbers for this year will be accurate over that time interval. With these uncertainties in even short-term projections of future production whether it be corn, ethanol or crude it is perhaps wise to continue a somewhat cynical view of projections over a longer time period. Although the bounding bar of a decline in existing field production continues to exist and will continue to require an offset in increased production from new wells to offset. Perhaps that lady in the tent of my youth may prove as prescient as some of the more optimistic forecasts that we continue to see.